The issue of income inequality is back in the news at a time when the U.S. public believes there is a growing gulf between rich and poor that is likely to continue, according to recent Pew Research Center surveys. 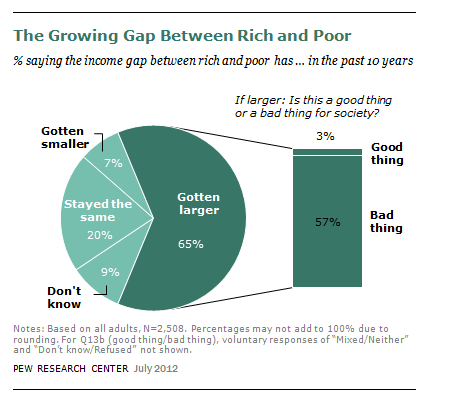 A substantial majority of Americans (65%) said in an July 2012 Pew Research survey that they believed the income gap between the rich and poor had widened over the last decade. Just 20% said it had stayed the same and 7% said it was smaller. Most of those (57%) who believed the gap had grown said it was a bad thing for society. The public sees this gap as an ongoing fact of life. A separate survey conducted in April 2012 found that Americans agreed by a 76% to 23% margin with the statement that “today it’s really true that the rich just get richer while the poor get poorer.” That gap had grown since Aug. 2002 when the margin was 65% to 33%, but the size of it was not much different than it was in 1987. 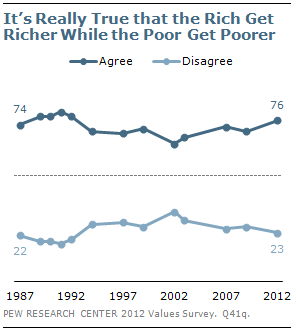 There was a large partisan gap when it came to the perception of the rich getting richer and the poor getting poorer. The share of Democrats (92%) who agreed with that statement had increased eight points since 2009 and was as high as it has ever been in Pew Research polling. A much smaller number of Republicans (56%) agreed. 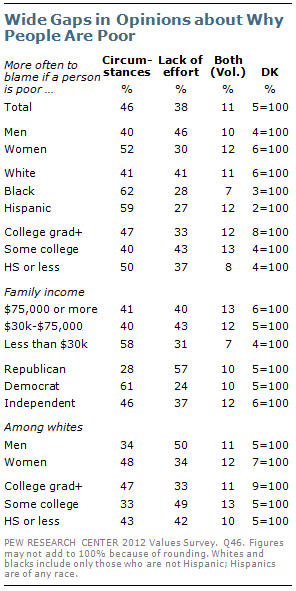 Nearly three-quarters (73%) of independents subscribed to the “rich get richer” perception. One of Obama’s assertions is that the growing gap between rich and poor has undermined “America’s basic bargain — that if you work hard, you have a chance to get ahead.” Indeed, just 35% of Americans agreed that “hard work offers little guarantee of success” while 63% disagreed in our survey last year. Those opinions have not changed substantially in recent years. What do Americans think of the rich? Views are mixed: Americans view the well-to-do as more intelligent and more hardworking but also greedier, our survey this summer found. About four-in-ten (43%) said the rich were more likely than the average person to be intelligent (with 50% saying there was no difference or expressing no opinion) and 42% said they were more likely to be hardworking compared with 24% who said less likely and 34% seeing no difference or offering no opinion. More than half (55%) saw the rich as more likely to be greedy compared with 9% who said less likely, and 36% who took neither side. Republicans were more likely to describe the rich as hardworking, by a 55% to 33% margin. About two-thirds (65%) of Democrats saw the rich as greedy compared to 42% of Republicans. When it comes to the question of why people are poor, less than half (46%) of those surveyed said that circumstances beyond one’s control were more often to blame while 38% said an individual’s lack of effort was more to blame. About one-in-ten (11%) cited both factors. In addition, 65% believed that most poor people in the U.S. do work but were unable to earn enough money. Just 23% said the poor do not work. There are sharp ideological divides on both those findings. Democrats said by a 61% to 24% margin that circumstances beyond one person’s control were primarily to blame for them being poor. Republicans took the opposite view: 57% blamed individuals who were poor for lack of effort compared with 28% who said it was due to circumstances beyond their control. On the question of being able to earn enough money on the job, 89% of liberal Democrats and 78% of moderate and conservative Democrats said poor people work but do not earn enough money. But only about half (53%) of moderate and liberal Republicans agreed. Conservative Republicans were evenly divided: 43% said the poor do in fact work but cannot earn enough while 40% said most poor people do not work.